THIS IS AN INCREDIBLE WASHINGTON DC AREA ESTATE OFFERING FOR A POKER CHIP COLLECTION OR A CATALIN BAKELITE LOVER. 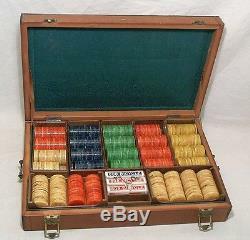 IT'S A MASSIVE 700 PIECE CATALIN BAKELITE POKER CHIP & 4 CARD DECK GAMING IN THE ORIGINAL CASE. THE CHIPS ARE IN THEIR ORIGINAL 100 COUNT WOOD TRAYS WITH ROUNDED BOTTOM SLOTS FORF 25 CHIPS EACH. ALL OF THE DESIRED BRILLIANT CATALIN COLORS ARE IN THERE. THERE ARE: 1 LAPIS BLUE CHIPS, 2 RED & CREAM SWIRL CHIPS, 3 JADE GREEN CHIPS, 4 BUTTERSCOTCH YELLOW CHIPS. THE ORIGINAL 2 CASE KEYS ARE STILL IN THERE TOO - SEE CLOSE UP PHOTOS. THE SET IS IN IT'S ORIGINAL HIGH GRADE GREEN FELT LINED WOOD BOX. THE WOOD SET BOX IS ENTIRELY COVERED IN FINE STITCHED SADDLE BROWN LEATHER. IT HAS 2 LOCKING BRASS CLASPS & HINGED BRASS SIDE HANDLES. THE SET CASE MEASURES APPROX. 18 5/8" X 11 3/4" X 3 7/8. THE SET IS COMPLETE, ALL ORIGINAL AND IN VERY NICE SHAPE. THE POKER CHIPS ARE NOT MELTED, CRACKED, CHIPPED UP, WORN DULL OR SOILED UP. THE CATALIN COLORS ARE BRILLIANT AND VIBRANT. ALL OF THE CHIP TRAYS ARE CLEAN, TIGHT & SOLID. THEY ARE NOT CRACKED, LOOSE OR WARPED UP. ALL OF THE TRAYS FIT IN THE SET CASE PERFECTLY. THE DECKS OF CARDS ARE NOT RIPPED UP OR ROTTED. THE CARD BOXES ARE ALL INTACT. THE CASE INTERIOS IS VERY CLEAN. THE GREEN FELT IS NOT RIPPED UP OR FALLING APART. THE OUTER CASE STILL RETAINS IT'S ORIGINAL BOTTOM FELT. THE WOOD SET CASE IS SOLID AND TIGHT. IT'S NOT LOOSE, WARPED UP OR FALLING APART. THE LID HINGES & CLAPS WORK PERFECTLY. THE ONLY MINOR ISSUE I SEE IS THAT THE LEATHER TRIM AT THE FRONT CORNERS OF THE CASE LID ARE STARTING TO LIFT SLIGHTLY AT THE STITCHING - SEE PHOTOS. THE LEATHER ON THE LID HAS SOME DISCOLORATION SPOTS HERE & THERE FROM AGE. THE BRASS HINGED SIDE HANDLES ARE BOTH SOLID & TIGHT. I HAVE NOT POLISHED UP OR TAMPERED WITH ANYTHING. YOU ARE SEEING THE SET RGHT OUT OF THE ESTATE WHERE IT WAS FOUND STORED IN A DECADES FORGOTTEN LIVING ROOM CLOSET IN A CLIMATE CONTROLLED PART OF THE ESTATE HOME. IT WAS NOT FOUND IN A WET BASEMENT OR OUTSIDE STORAGE. I HOPE THIS SET GOES TO A GOOD COLLECTION. I HAVE NEVER HAD OR SEEN A CATALIN GAMING CHIP SET THIS BIG BEFORE. IT'S BEING OFFERED WITH NO WARRANTIES AS VINTAGE PRE-OWNED HOME CARD GAMING EQUIPMENT FOR A COLLECTION. THE IT'S BEING OFFERED DIRECTLY FROM THE ESTATE & AS PICTURED HERE. PLEASE SEE ALL PHOTOS BELOW. ALL ITEMS I OFFER ARE FROM NUMEROUS EAST COAST ESTATES (MOSTLY FROM MARYLAND, WASHINGTON DC, VIRGINIA, NEW JERSEY AND PENNSYLVANIA). I HAVE BEEN A PROFESSIONAL ESTATE PERSONAL PROPERTY CONSIGNMENT & LIQUIDATION LLC FOR 15 YEARS. YOU ARE SEEING ITEMS BROUGHT TO ME RIGHT OUT OF THE ESTATES. I DO NOT TAMPER WITH ITEMS, POLISH UP ITEMS OR ALTER THEM IN ANY WAY. I DESCRIBE EXACTLY WHAT I SEE. ALL ITEMS ARE BEING OFFERED AS FINAL SALES FROM ESTATE LIQUIDATION WITH ALL WEAR OF A USED VINTAGE ITEM. I WILL ONLY CALL AN ITEM MINT IF I TRULY BELIEVE THAT IT'S IN MINT CONDITION. I WILL ONLY CALL AN ITEM RARE OR SCARCE IF I TRULY BELIEVE IT TO BE SO. THE ITEMS LISTED HERE ARE NOT BEING OFFERED LOCALLY AT THE SAME TIME. IE: IF A VALUABLE ITEM HAPPENS TO GO SUPER CHEAP, YOU GET IT CHEAP. MY AUCTIONS ARE STRAIGHT FORWARD. MY DESCRIPTIONS ARE CLEARLY WRITTEN & PLAIN TO UNDERSTAND. I TAKE NUMEROUS EXCELLENT CLEAR CLOSE-UP PHOTOS OF THE ITEMS. I USE PLAIN BACKGROUNDS AND SIMPLE PLAIN FONTS. I DO NOT BELIEVE IN FLUFFY BORDERS, FANCY BACKGROUNDS, OVERBLOWN HYPE WORDING OR CONFUSING FANCY LETTERING FONTS TO PROMOTE HYPE IN ATTEMPT TO MAKE AN ITEM APPEAR MORE SPECTACULAR THAN IT REALLY IS. COL LECTORS PLEASE DO NOT WORRY. THE ESTATES USUALLY PREFER STRAIGHT AUCTIONS TO FOLLOW THROUGH. SOMETIMES ITEMS DIE AND SOMETIMES THEY DO MUCH BETTER THAN ANY OFFER. I HOPE ALL OF MY ITEMS WILL GO TO PEOPLE WHO WILL ENJOY THEM. I WILL GLADLY ACCEPT A RETURN AND/OR TAKE CARE OF A PROBLEM IF I DO MAKE A GROSS ERROR IN DESCRIPTION. IF I MADE NO GROSS ERRORS, THE ITEM IS AN ESTATE FINAL SALE. THIS IS MERELY DUE TO THE ITEMS BEING ANTIQUES / VINTAGE / PRE-OWNED. PLEASE ASK ALL QUESTIONS BEFORE THE ITEM ENDS. I TEST ALL WIND UP TYPE ITEMS & WATCHES AS BEST AS POSSIBLE BEFORE LISTING THEM. I DESCRIBE EXACTLY WHAT I OBSERVE. PLEASE NOTE: MANY OF MY ITEMS COME FROM BEING STORED IN OLD ESTATES FOR MANY YEARS. I HAVE NO IDEA WHAT SMELLS "OLD" TO SOMEONE, OR WHAT "SMELLS LIKE TOBACCO SMOKE" TO SOMEONE. MOST OF THE ITEM I OFFER ARE OLD. JUST ABOUT EVERYBODY SMOKED BACK THEN. SOME OF MY ITEMS SAT FOR DECADES IN OLD ESTATE HOMES WHERE THERE WAS PROBABLY TOBACCO SMOKING GOING ON AT ONE TIME OR ANOTHER. THIS WILL COST A GOOD BIT MORE THAN NORMAL UPS GROUND IN THE LOWER 48 STATES. I DO NOT DO PICK-UPS AT ALL DUE TO A HORRIFIC BUSINESS SCHEDULING. The item "MASSIVE OLD 700 PIECE CATALIN POKER CHIP SET LAPIS / JADE / RED / BUTTERSCOTCH" is in sale since Friday, May 27, 2016. This item is in the category "Collectibles\Casino\Chips\Poker Chips". The seller is "brtcarguy" and is located in Severna Park, Maryland.